Oh did she say the "F" word? I'm in an honest mood today and it just happened that I got a comment on my facebook page that made me want to really talk about this subject, which I have been dodging for a long time. I think every vintage blogger who wears fur has talked about this issue but here we go again. After posting some pics of my furs on facebook, I received comments "Is that real fur?" and "Great closet!!!! and hoping your furs are synthetic....."
Well no, in fact they are not. They are vintage and I wear them and enjoy them. I do love animals. I had 3 kitties and a ferret for the longest time and as a kid, we had a dog, cat, iguana, a tarantula, snakes, mice, rabbits and a wolf....not all at the same time, of course. Our current family pet is a little hamster named Sour Cream who is just as soft as cashmere and sweet as can be. I prefer to see the lovely fur on a living creature, happily going about its business but if I come across an old fur in a thrift store, flea market or it's passed on to me as a gift, it's not going to end up in a landfill. I'm going to wear it. I wear it to appreciate its beauty and warmth. I don't often wear modern faux furs because they are made of polymer fibers created from coal and petroleum. These faux fibers take up to 1,000 years to break down. That's not very environmentally friendly and I don't care for the way it feels, to be honest. Its very scratchy and uncomfortable. There are some very nice quality faux furs on the market today but I still don't like the idea of mass produced stuff piling up, which is a major reason why I wear vintage. I do have one modern fur. It's a fox and it was trapped by a friend of the family, who is a re-enactor. The bones were used for buttons and such, the meat- although not a great meat to cook was eaten (cause that's what you do when you're in the middle of nowhere), the brain used to tan the skin. He traded the fur with my husband for some hand made soap and leather pouches and it ended up in my hands, where I finished it as a stole, and am still hunting around for the right glass eyes. I also wear leather, wool, fur velour hats and enjoy a good cheeseburger more often than I should but it's my personal choice. If someone came up to me in a restaurant and said "Oh yummy, That looks good but I hope it's a veggie burger!" I'd probably punch 'em in the eye and tell them where to shove their opinions. Some may say "but you don't have to wear fur, it's just for vanity" well, I don't -have- to eat meat either. The meat and dairy industry is terribly cruel and freaky with their hormones and genetically modified everything but in the end, I still order a burger or bacon on my pizza. Its a personal choice. I must admit, for the past few years, I've been afraid to bring the topic up because I've seen the harsh backlash on other vintage fashion blogs but I remember that I'm here because I want to remind other women to be independent. To do your own thing and to wear what makes you feel good, regardless of what society thinks you should wear. If I can't do that openly on my blog, I feel like I'm failing my readers and myself. If you have a few furs end up too old and messed up to wear anymore or if wearing fur isn't your cup o' tea, you can donate them to Coats for Cubs, an organization helping to rehabilitate orphaned wildlife. You may also enjoy this interesting article from Collector's Weekly "Should you Feel Guilty About Wearing Fur?" Thanks for speaking up on this issue. It really is a personal issue and I hate when people get all judgmental on topics like this. I too have a few pieces of vintage fur and I love wearing them! My thought is that if you are comfortable wearing fur, go for it and if you are not you don't have too. I rarely comment on any blogs but I had to stop in to say, "You go girl!!!". :) Thank you for writing about this so honestly, openly and with good sense. Very nicely put! It is a personal choice and if you want to wear them then it's up to you not someone else to decide. Good for you! I have no issues at all with vintage furs, it's new fur and the current fur industry that I really don't like. Living in a cold climate, I think wearing vintage fur is a smart choice as it keeps you toasty warm. I have a vintage white rabbit stole that was my grandmother's which I treasure but don't wear. Fur can really be a hot button issue and I applaud you for tackling it so honestly! Great post! I've only experienced one negative reaction when wearing my fox stole, everyone else wants to pet them. Everything I have came from my Mommom or from an antique shop. I'm a vegetarian but have no problem wearing vintage fur. I've talked about this one more than one occasion and even received death threats afterward. It's difficult to talk about for sure. You cover a really good angle when mentioning the products that faux fur is made of, and that it is WAY worse for the environment. Good job! *Nodes head vigorously in agreement!!! * I'm with your completely when it comes to vintage fur. I don't own a ton, but that which I do, I sport with happiness and zero shame or guilt. I'm sorry that the dear animals had to perish in to make those pieces decades ago, but by the same token, I'm very glad that I can now help their (pelts) live on for many years longer, instead of potentially ending up at the bottom of a landfill or deteriorating in a stuffy, damp attic somewhere. To each there own on the fur, as in all kinds of, fashion front, but here as with so many areas in life, if one doesn't have anything nice to say (to you or another fur wearer) they should simply say nothing at all. Well written, Brittany! 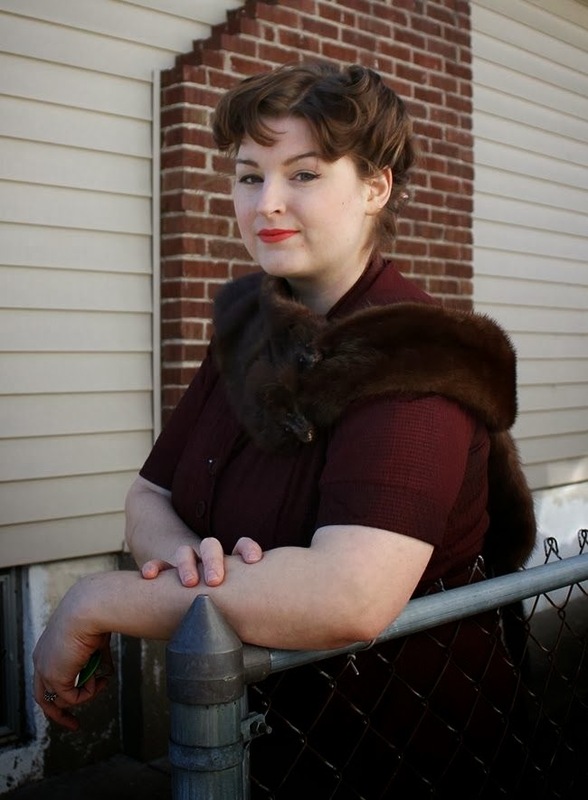 I wrote a bit about wearing vintage fur a few years ago and got several negative remarks, lost about a dozen readers who were offended. I had no idea it would have been such a big deal so I applaud your bravery in talking about it! I respect those who lobby for an animal's right to safety but I also refuse to pass up a wonderful vintage fur and let an animal's sacrifice go to waste. You stood up for yourself, good for you, sweetie. I rarely comment, although I do read and enjoy your posts very much. I had to chime in on this one. though. I too, wear vintage fur. And it all came from thrifting and estate sales. My favorite purchase this year is a black leather 70s jacket with raccoon collar that I got for $13 at Salvation Army, taking a close second to my mink wraps and fluffy fox hat. Would I ever buy a new fur or support the fur industry's killing of animals for their fur...no...but like you, I would rather wear them and preserve them then have them deteriorate...somehow I think that's more disrespectful. But it's tough to put them on and get the evil eye from people...I sympathize! I think your fur looks beautiful, you're extending the life of a long-dead creature, and caring for it well. And it really is one of the warmest materials out there. As a person who doesn't feel comfortable wearing even vintage fur, I'd still like to say that I agree with your stance. I can't believe people would comment about it to you. Your "I hope that's a veggie burger" comparison is a great one. Why would people think it's appropriate to tell you what to do? The reality is that most ethical issues are pretty fuzzy, there is no perfect option, and we all have to make our own choices. I don't want to wear real fur because thinking about where it has come from makes me uncomfortable, but that is a very personal reason and I acknowledge that vintage fur is a pretty ethical choice for others to make. I love this post! I agree that wearing vintage fur is the way forward. As you say, the animals died a long time ago and you are not supporting an industry that is cruel and inhuman. I don't own any vintage fur but I would have no qualms about buying it if I found a piece that I loved. After all I wear leather and eat meat. I rarely comment on blogs either, but I do love your blog. This post is just brilliant. It sums up exactly how I feel. The amount of times Ive been wearing a stole or coat and people crinkle their noses up and ask if its real. Ive taken to saying yes, and its older than your grandparents - problem? The annoying thing is more often than not said person is wearing UGGS!! dear, where do you think the sheepskin for your ugly footwear comes from? Funnily enough, I have a 60's fur that IS fake that was my grans. I get the same comments, people avoid me on public transport, give me filthy looks. Yes it look real, no it isn't real, and its vintage anyways. I LOVE my vintage furs. Why waste good furs and support the modern fur trade? I don't think you have to defend yourself lovely, but you did a good job of it anyway! Sadly I don't think there's ever any convincing some people that we aren't monsters for wearing vintage fur. I've even heard "you might inspire other people to buy and wear fur" as an argument against it (but shouldn't that also rule out synthetics?) Stay strong, I really do hope this post will nip any hate people might be inclined to post in the bud. This is a great post, good for you! And I agree with you completely. I own several pieces of vintage fur and enjoy them for the same reasons. Some are family pieces or came from close family friends, while others have been "rescued" from antique shops or yard sales. I can't bear the thought of something so beautiful going to waste in a landfill simply because someone out there in the world might not like it. And your point about fake fur is very good too. Although the quality is much better today then it used to be, it's not very eco-friendly. Wearing fur of any kind, like eating meat, is a personal choice. There should be no excuse for rude comments from strangers just because they disagree. Well put! You are so right...if someone i going to harangue you for your fur, where are they when you eat meat (probably enjoying a burger of their own!!!)?? If a person truly loved animals then they would also have respect for animals that lost their wee lives to the fur trade, not spoil or desecrate them. Do they want the furs the end up in a landfill? Is that respecting the life they gave up? Nope. I "rescue" many thrift store furs to give them a home and lease on life (and why not look fab and stay warm while doing so)! I don't rescue many vintage store furs because I know they are in the right place to be "adopted". We can't prevent what happened in the past, but we can reconsider what we buy NEW today. Thanks for posting! I got a vintage fur for Christmas this year. I think it's wonderful and elegant and is warmer than any modern high-tech coat I've worn. I agree with what you've said. I live in a deer-hunting area - you can bet I'll bring that up if anyone questions me! (what do hunters do with deerskin, anyway?) Thank you for being strong! Oh, something else that people have to keep in mind: the higher the quality of the fur-and I can tell that yours are of very high quality-the more humane the death of the animal. They were well kept and well fed so that their coat had a healthy luster. They were not give growth hormones or other disgusting stuff, and they died a quick, humane death. Some of them even had the privilege of growing up wild and dying without pain in a trap, like your fox stole. This was nothing like what meat cows have to go through to provide us with a burger. I wear fur, both vintage and modern. I live in the midwest, and my mink coat is the warmest thing I own. I agree, I eat meat, wear leather, and I respect other animals and my planet. I really think the whole real fur thing is getting such a bad rap. So good for you! Wear it proudly, and stay warm. "But if I come across an old fur in a thrift store, flea market or it's passed on to me as a gift, it's not going to end up in a landfill. I'm going to wear it." - I like that statement. I've struggled with whether to sell vintage furs on my site over the years. But I always decide to continue to sell them because I can't pass them up when I'm buying stock. I'd like to see them get more use rather than be trashed. I don't wear fur myself, but I don't pass judgement on people who do wear fur. And gals who wear it shouldn't feel guilty. Oh yes, selling is certainly another great option if you don't mind the idea of fur but dot wear it personally! I am totally against the wearing of all fur, vintage or otherwise. The older the fur the more likely the animal was kept in appalling conditions. The above link is very interesting and gives some ideas as to what to do with a vintage fur other than wear it! PETA also say wearing vintage encourages people to buy new furs. They ostensibly protect animal rights, but they DON'T protect animals. They are well known for doing things like letting show dogs into NYC traffic rather than let them be "abused" at the show. Or the official party line regarding animals like cows (which are too stupid to live without help thanks to domestication) is that if all of the cows died out because humans were removed from their picture, it would be fewer cows being abused. This is not to say that everyone involved in PETA is a supporter of such silly things, but that is an official and recognized part of the organization. If you want to support animal rights, donate to the ASPCA or other such places. This is something I find very uncomfortable. Personally I would never, ever, wear real fur, vintage or otherwise. If I got given a vintage fur I'd give it a decent burial and let it decay like to poor creatures that gave up there sorry little lives to create it. Animals like mink are not part of our food chain and their fur is not the by product of industry, the only reason to breed them is to slaughter them. Having said this I would never dream of having a go at a vintage fur wearer, it's none of my damn business what you choose to do. My great-uncle used to raise mink. Apparently, they are the nastiest creatures. They would get bored in the cages, so would put food down the legs of their cages, so it would rot, and invite rats. And when the rats would get close, the minks would bite the faces off of the rats and kill them. Just for fun. I think they'd just be slaughtered right out if it wasn't for the fur trade, in all honesty. Nasty nasty creatures. I have to admit, I do have two fake furs that I wear the heck out of ... and then I have this gorgeous vintage mink halo hat that I've never worn for many reasons. I'm actually torn between "I don't wear fur because I don't believe in killing for skins" and "I eat meat, wear leather, would probably eat and wear bunny" mindsets. I oscillate between being an animal rights activist (not a crazy PETA person) and wearing vintage fur. I fish, but would probably not hunt (guns freak me out and bows hunting just takes too damned long to learn). However, I would gladly take a bit of quail or venison or turkey anytime. Thanks for putting this into perspective for me and being brave enough to come out and say what I've been struggling with for a long time. I'm still not sure if I will wear my halo hat ... but you never know. I also have vintage fur from my great grandmother and my grandmother, I do not wear them often but my vintage styled daughter does when she goes out to special events like the opera. I think it is reusing something not buying new fur. I am glad you posted your opinion on this sensitive topic. First, you look fabulously glamorous in fur! I think most of the complaints people have with wearing fur doesn't really apply to wearing vintage fur since you aren't really creating more demand for animal furs and the animals involved are long since gone. That being said, I've never been brave enough to even purchase vintage furs when I find them partially because I wonder if I would get weird looks, but have ventured into a little faux fur. I think it's kind of hard to tell how others will react to wearing even faux fur, but then sometimes you have to get over it and go for it. I think it also makes a difference where you are wearing it and how you style it. If you're going to a fancy event and are dressed to the nines, then it makes a little more sense. If you're going to a conservation event, be a little understanding that others may be offended even with faux fur. I also wouldn't wear it around family or aquaintances I knew were sensitive about, just out of respect for them. You know you are going to find cynical people everywhere. Aren't there more important battles to voice opinions about? You know what kind of gets my goat is when people go to vintage sites or blogs and complain. Haven't they learned yet that it was a big part of vintage history? Geeeze. I should follow up that comment by saying "negative opinions". I think the most important point is... be true to yourself! While I completely agree with you, many wouldn't. That is their choice, and I doubt very much that many fur wearers go up to non-fur wearers and judge what THEY do... why should it happen the other way around? Anyway, I think you look very elegant in your humanely sourced, vintage furs! Congratulations on sharing your opinion and views in a professional, sensible way. I've sold vintage fur in my shop several times, even vintage from the 80's...think fur headband. It was a tough call to keep some pieces for myself or sell them but whether I had choose not to buy them, buy them and wear them or buy them and sell them is MY choice and no one has to live with my choices but me. On the note that buying vintage fur encourages the current fur trade I couldn't agree with you more that current fur prices are off the charts but I have to add that I've have several customers walk through my doors looking for fur and they had already made up their mind that's what they were looking for/ buying. I've never heard a customer say "oh, this vintage piece is so awesome I want a new one", but I've heard " I'm looking for a fur and can't decide if I want to buy new or buy vintage, what do you have for sale?" If anything, in my experience, selling vintage fur hurts the current market. I could not agree with you more. It is your choice to wear them, and really, there's nothing wrong with that (particularly considering the provenance). You look gorgeous in the furs—and as a Michigan native who's not fond of the cold AT ALL, I'm all for donning them. People need to learn not to attack others for making choices that do not actually hurt them. It's not as if you're Cruella de Ville or wearing a Lassie-fur collar (though as a collie 'mom', I could probably whip several up without actually hurting Ben, let me tell you...just vacuumed yesterday and there's probably enough collie tumbleweeds on the floor already for a few collars...). Good for you, not being cowed by others' supposed right to rule over you. A well written article on a sometimes awkward subject, great job! I wear vintage furs too, & fall into the "do what's right for you" way of thinking. The thought of letting a well made garment go to a landfill makes me a bit sick. I don't know if anyone around you does this, but a few little old ladies here search for vintage furs & repurpose them into teddy bears. Thanks for the good read, keep holding on to your beliefs, confidence looks great on you! Everyone always have an opinion on everything-- oh well! You look great, you've thought about it, you aren't supporting modern fur trade, and you are honoring animals instead of throwing them in the trash. I think you are awesome and brave to discuss it openly like this!! Great post! Hi Brittany, I applaud you for your candid and honest views. You look great in the pictures. I have never owned any kind of fur (for no particular reason), but I applaud you for sticking with what you like! I must just say that I absolutely LOVED this post!!!! It's simply gorgeous! And I will probably never stop. Amen, Sister! You took the words right out of my mouth. I've been saying this for YEARS and it's nice to see other women appreciate vintage furs in the same manner that I do. While I would NEVER spend the money on a modern fur, I am more than happy to purchase a vintage fur as it is a way to honor the animal that gave up its beautiful coat for a stole, muff, or hat. How disrespectful it would be to allow it to rot in a trunk, closet, or *gasp* a landfill! Thank you for having the guts to approach such a difficult topic.